Q: On March 10 local time, an Ethiopian Airlines jet crashed after taking off from the capital of Ethiopia en route to the capital of Kenya, killing all 157 people on board, including eight Chinese. We know that the Spokesperson of the Foreign Ministry already issued a statement late last night. Do you have any updates for us? A: On March 10, an Ethiopian Airlines flight crashed, killing all people aboard, including eight Chinese citizens. We are deeply saddened by this incident. We want to express our deep condolences to the victims and sincere sympathy to the bereaved families. Chinese leaders, including President Xi Jinping, have sent messages of condolences to Ethiopian and Kenyan leaders respectively. The Chinese Party and state leaders attach great importance to this incident and are very concerned about the Chinese citizens involved in this disaster. The Foreign Ministry and our Embassy in Ethiopia reacted immediately. Our Embassy in Ethiopia has established coordination and liaison mechanism with the Ethiopian side and made contacts with the families of the Chinese victims to assist them in dealing with the follow-up matters. To date, some preliminary information of the eight Chinese victims have been confirmed. Four were employees from Chinese companies. Two were UN staff. Two were from Liaoning province and Zhejiang province respectively, traveling for private purposes. The latest information I have is that on the afternoon of March 10, Ethiopian Prime Minister Abiy Ahmed Ali went to the crash site to express his deep condolences to the victims. He also pledged necessary assistance to the bereaved families and urged relevant officials to make thorough investigations. At the current stage, investigation is still underway to determine the cause of the crash. A committee comprising of Ethiopian Airlines, Ethiopian Civil Aviation Authority and Ethiopian Transport Authority has been set up to carry out the investigations. 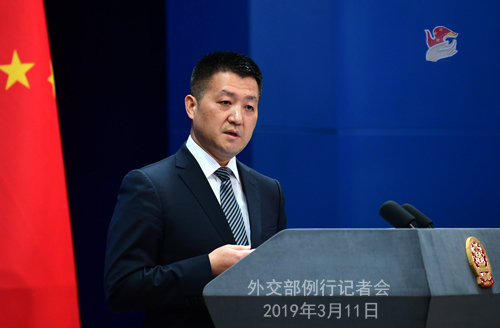 The Chinese side hopes that the Ethiopian side will determine the cause of the crash as soon as possible, provide information on the progress of the investigation in a timely manner, and properly deal with the follow-up matters. The Foreign Ministry and the Chinese Embassy in Ethiopia will continue to closely follow the development of the situation and do our best to assist the families of the Chinese victims. Q: Italy's possible participation in the Belt and Road Initiative has been a subject of discussion lately. We noted that Italy's Prime Minister Giuseppe Conte explicitly said that Italy's accession to the Belt and Road Initiative represents an opportunity for the country. It is a strategic choice for Italy and won't mean that Italy will be forced to do anything. It will provide Italy with access to the initiative and channels for dialogues. What is your comment? A: China and Italy enjoy sound relations. Practical cooperation between the two sides in various fields has yielded fruitful outcomes and made tangible contributions to the economic development of the two countries. Expanding mutually beneficial cooperation, as a strategic choice made by China and Italy, serves the common interests of the two sides. Over the past six years since its inception, the Belt and Road Initiative has been receiving growing support and participation from the international community. Fundamentally, it is because this cooperation platform serves the development needs of all participants, and the principle of wide consultation, joint contribution and shared benefits has been approved worldwide. More importantly, cooperation outcomes have been translated into the economic and social development and improvement of people's livelihood and employment in all participating countries. Italy is an important industrialized nation and a developed economy. We welcome Italy's participation in the Belt and Road Initiative which we believe will create greater space for mutually beneficial cooperation and bring more benefits to the business communities and the public of our two sides. Q: The US Ambassador-at-Large for International Religious Freedom, Sam Brownback, has been in Hong Kong last week and he is currently in Taiwan. He has made some very strong comments critical of China in both places, including criticizing China's treatment of Uyghurs in Xinjiang. What is your reaction? A: Your question touches on two aspects. First of all, I want to stress again that China firmly opposes any official contacts between the US government and Taiwan. This position is rock firm. Secondly, we have noted these wrong remarks made by the relevant person. We deplore and firmly oppose that and have made stern representations with the US side. The Chinese government protects its citizens' freedom of religious belief in accordance with law and people of all ethnic groups in China fully enjoy their right to freedom of religious belief in accordance with law. The Chinese side consistently opposes the US side cooking up or using the so-called religious issues to interfere in other countries' internal affairs. We urge the US side to face squarely and respect basic facts, cast aside prejudice, choose its words and actions carefully, view China's religious policies and freedom of religious belief in an objective way, stop using the so-called religious issues to interfere in China's internal affairs. This person in question mentioned the so-called issues in Xinjiang. I want to say that the affairs of Xinjiang are China's internal affairs. Xinjiang set up the vocational and educational training centers as a preventive counter-terrorism and de-radicalisation measure. They are not the so-called "re-education camps" claimed by the US. Facts have proven that the measures taken in Xinjiang to counter terrorism and maintain stability enjoy extensive support from all ethnic groups in Xinjiang. 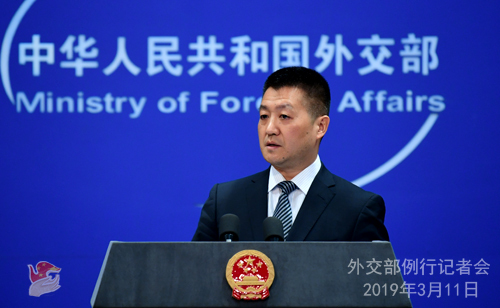 We urge the US side to discard its double standards on counter-terrorism and counter-separatism, stop using Xinjiang-related issues to interfere in China's domestic affairs, and contribute to enhancing mutual trust and cooperation between China and the US, instead of the contrary. Q: According to reports, during a session this week, the European Parliament will call on Brussels to assess the cyber threat of China's participation in the development of 5G telecommunications system and analyze the possibility of access to hidden data by foreign IT equipment. A draft resolution set to be voted on March 12 said that the increase of China's technological presence in the EU poses serious security threats that require urgent action to be taken at EU level. What's your comment? A: As far as I know, not a single country or organization has been able to provide convincing evidence in support of the so-called technology security threats posed by China. The playing-up of this issue and concerns raised by ill-informed people are short of definite evidence. Science and technology, a force without borders, is an important foundation for the sustainable development of the world economy and crucial impetus for common progress of mankind. Suspecting and guarding against each other in the absence of evidence and following a beggar-thy-neighbor policy are not in line with the course of globalization or scientific and technological development. You may imagine, if all economies were to resort to insulation, we would end up in a situation where developed economies who need the markets more will suffer more. As champions and defenders of multilateralism, China and the EU share clear consensus and common interests in upholding rules-based multilateralism. We hope the EU will remain objective and rational, stay committed to the ideal of openness and cooperation and the free and fair principle, refrain from protectionism and making everything a political or security issue, and avoid sending wrong signals so as to provide a fair and just environment for China-EU cooperation across the board, including in science and technology and promote the sound and steady development of our comprehensive strategic partnership. Q: About two weeks ago, a Twitter account appeared, which claimed to be the Chinese Foreign Ministry's official Twitter account. Can you tell us if it is your Twitter account? If it is not, have you complained to Twitter and asked them to remove it? A: You are not taken in by that, right? I can tell you responsibly that this is a fake account. Again, this underscores the need for us to have a discerning eye, act in an cooperative spirit and address the challenges in cyber security through international cooperation. Q: A recent opinion article carried by the Globe and Mail said that China suspended some Canadian canola imports on spurious excuses. This isn't about canola, and China is resolved to intimidate and coerce Canada. What is your comment? A: I already answered relevant questions last week. You may have noted that the General Administration of Customs has issued relevant notice. Recently, the Chinese customs has intercepted quarantine hazardous organisms in imported Canadian canola on numerous occasions, which will severely endanger agricultural production and ecological security once introduced into China. In order to prevent the spread of these organisms at source, the GAC has since March 1, 2019 suspended the canola imports from a Canadian company repeatedly found to have the above-mentioned problems. As far as I know, the GAC has already notified the Canadian side of the relevant situation. I shall stress that it is the Chinese government's responsibility to protect the safety and interests of the Chinese consumers and the agricultural production and ecological security of the nation. The above-mentioned measures taken by the Chinese customs are for the sake of quarantine safety and prevention. They are scientific and reasonable and fully conform to relevant Chinese laws and regulations as well as international practice. Q: Will the Chinese government release the names of the Chinese passengers on the Ethiopian Airlines flight? A: I just told you the basic information about the eight Chinese citizens killed in the accident as verified initially. The cause for the accident is still under investigation and we need to have more communications and further confirm with the relevant parties, including the families of the victims as for whether more information will be released. I believe you can fully understand that this is a way we show respect to those victims who have passed away. Q: The issues regarding terrorist Masood Azhar's case is coming up in UN Security Council's 1267 Committee again on March 13, according to reports. There was an appeal by India on Saturday that all the permanent members of the UNSC should declare him a terrorist this time in light of the recent tensions between India and Pakistan. Can a decision of China be expected this time? Can you again give us some insight into it? A: The UN Security Council and its subsidiary bodies are run on strict rules. You just quoted what the reports said about how the relevant discussions went inside the UN subsidiary body, which is quite dubious. I'm afraid no judgment should be based on the information gathered through an inappropriate channel. We already stressed China's position on the listing of terrorist organizations and individuals in the UN Security Council 1267 Committee on many occasions. 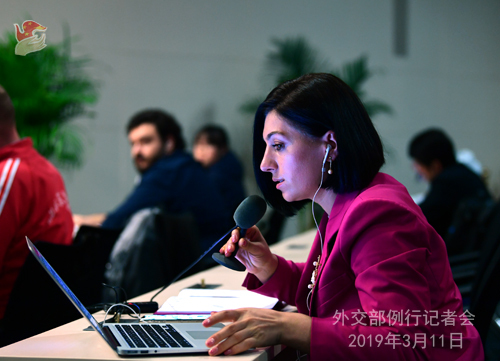 China has all along participated in relevant discussions in a responsible manner and in strict accordance with the rules of procedure and provisions of the 1267 Committee. China will continue to communicate and work with relevant parties in a responsible manner so as to properly resolve this matter. Only by making a decision through responsible and serious discussions can we find a lasting solution. Follow-up: China is also holding talks with both countries during this current round of tensions between India and Pakistan. Is the issue of counter-terrorism being discussed? A: A series of incidents have transpired between Indian and Pakistan recently, which as we see is not conducive to the peace and stability in South Asia. Like I said before, China has been mediating between the two sides, engaged in dialogues and working very hard to promote talks, ease tensions and improve their relations. In our exchanges of views on regional situation, the security issue features in our discussion with Indian and Pakistan. We have had extensive and in-depth talks with both sides. Q: Last week Meng Wanzhou who is free on bail in Canada sued the Canadian government over her treatment. In China, Canadian citizens Michael Spavor and Michael Kovrig are in jail and apparently unable to even see a lawyer. When will rights and freedoms afforded to Meng Wanzhou in Canada be afforded to Michael Spavor and Michael Kovrig in China? A: Regarding the lawsuit Ms. Meng Wanzhou filed against the Canadian government and its relevant departments, like we said many times, it is completely understandable that a Chinese citizen uses legal tools to protect her legal rights and interests and seek justice. As to these two Canadian citizens against whom the Chinese security authorities have legally taken compulsory measures in China, like we said, the Chinese side has strictly fulfilled its obligations under the consular agreement between China and Canada, and their legitimate rights and interests have been fully guaranteed.